The featured event for this Weekend Warrior post is the Protest Du. Ever dreamed of wearing a bejeweled championship belt like Floyd Mayweather or a shiny crown like the Queen of England? If so, then don't miss your chance at the Protest Du this Sunday, August 17th. Every year, the overall male winner of the Protest Duathlon is named “Duathlon King” and wears the belt for the next 365 days, and the overall female winner is crowned “Duathlon Queen” and sports the jeweled tiara throughout the year. The Protest Duathlon is the main event and fundraiser for Austin’s hippest athletic club, the Austin Duathletes. Known for their infamous “pub runs” and annual “Red Dress Run,” this FREE club is also famous for putting on races with their own bizarre twist. 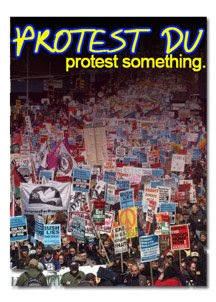 Don't miss out on the fun - sign up today and protest something!